This Ninja Warrior costume made nearly everyone's short list of favorite designs. embellishing with gold braid, ribbon and felt. Belt: Cut a piece of red felt 32 inches x 6 inches. Fold in thirds lengthwise to make the width 2 inches wide. Glue lengthwise to hold secure. 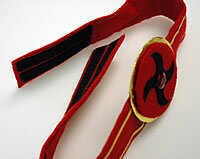 Glue 2 pieces of gold trim to the front of the belt Â¼ inch from edges. Iron onto the belt two 4 inches pieces of black VELCRO® Fabric Fusion fastener with hook on one end and loop on the other end of the felt belt for closure in the back. Buckle: Cut a piece of cardboard into a 3 1/2 inch diameter circle. Cover with 5 inches round piece of gold fabric. Wrap and glue the excess fabric to the back of the cardboard. Cut a 3 inch diameter circle of cardboard and cover with a 4 inch circle of red felt. Glue the excess fabric to the back of the card board. Cut out Ninja star from pattern in black felt and glue it to the center of the red circle. Glue on the red gem to the center of the Ninja Star. Thread ribbon through the sword belt to attach it to the belt. Cut an 8 inch x 6 inch piece of black felt. Iron on 2 inches of the loop side VELCRO® Fabric Fusion to each end at the top on the inside of the veil. Iron on hook side of VELCROÂ® Fabric Fusion in the corresponding position on each side of the sweatshirt hood just under the nose area. Cut two 1 1/4 inch yards of black ribbon for leg ties. Attach with a 1 inch x 1/4 inch hook piece of VELCRO® Fabric Fusion. Iron on each ribbon. Iron on a 4 inch piece of loop Fabric Fusion to the middle of each back leg. Do the same to the arms using a smaller piece of ribbon, about 30 inches long. Wrap ribbon ties around legs and arms and tie to gather in the fullness of the sweatshirt at the upper arms, and below the knees in the sweat pants.